At yesterday’s Executive Management Committee meeting, CEO Phil Washington announced that the Crenshaw/LAX line is now expected to open in mid-2020. The Crenshaw/LAX light rail line is 8.5 miles long, extending from the Expo Line’s Exposition/Crenshaw station to the Green Line’s Aviation Station. It will eventually connect to LAX via a people mover, expected in 2023. Metro broke ground on the Crenshaw line in early 2014, and at the time had forecast it to open in Fall 2019. For the past few years, Metro staff have been reporting that Crenshaw has been 80 or 100 or 120 days behind schedule, and the agency has dipped into contingency funds to try to stem schedule creep. As recently as September, Metro construction staff reported that the project was approximately five months behind, but declined to state a projected completion date. Yesterday, Washington reported that construction is ninety percent complete, but “four to six months” behind schedule. Metro had targeted the project to reach “substantial completion” in May 2019, after which Metro would test and train, typically for roughly six months, before opening the line to the public. Per Washington, the substantial completion date is now expected to be December 2019 (seven months behind schedule.) Metro will “expedite testing” and open to the public around May or June 2020. Later in the day, the agency posted a tentatively worded announcement of the new Crenshaw date. It is possible that the date could slip further. Also in play is the operating plan for the new line. As SBLA reported in June, Crenshaw Line operations are tied to the Metro Green Line. Metro staff have recommended an operations plan (now called alternative “C-1”) that would combine Crenshaw with the portion of the Green Line east of LAX; this ~24-mile L-shaped line would run from Expo/Crenshaw to Norwalk. The Green line west/south of LAX would operate as a ~3-mile line from LAX to Redondo Beach. South Bay interests, led by the South Bay Council of Governments, are opposed to staff’s recommended alternative, which would leave them with a short stub line, necessitating transfers at LAX. 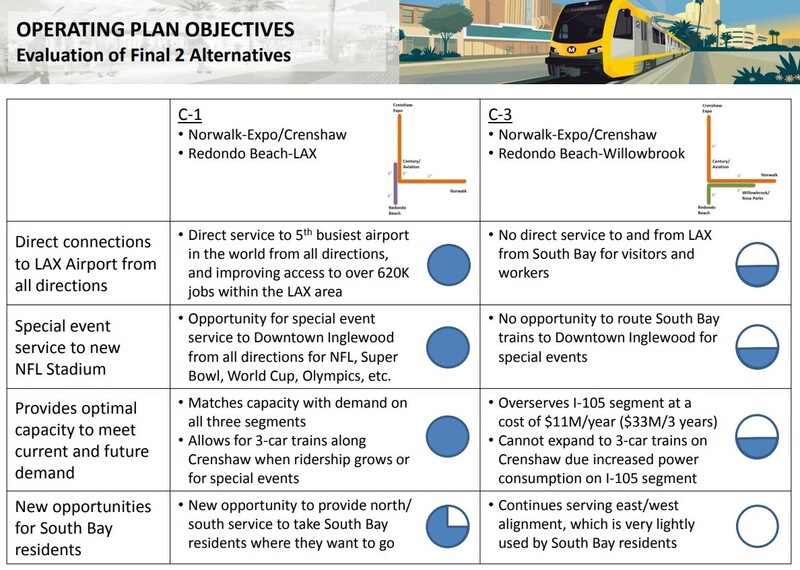 They prefer alternative “C-3” which would run the ~24-mile Expo/Crenshaw to Norwalk line, interlined with an ~11.5 mile line extending from Redondo Beach to the Rosa Parks Blue Line Station in Willowbrook. In the long run C-3 would make it more difficult for connections between the South Bay and LAX, but in the short run it would preserve service that more closely resembles what the South Bay has today. Metro staff project that C-3 operations would cost $87 million annually, compared to $77 million for C-1. The staff presentation shows that today Green Line riders boarding in the South Bay mostly do not travel east of LAX. At yesterday’s Operations Committee, staff had recommended approving alternative C-1 for initial Crenshaw operations, and re-evaluating operations when the Green Line is extended to Torrance – expected around 2028. County Supervisor Janice Hahn, who represents the South Bay, put forth a motion for Metro to instead implement alternative C-3 as a one-year pilot. Hahn characterized C-1 as a “crazy change,” and posited her motion as a way of keeping things the way they are. Committee chair Mike Bonin opposed Hahn’s C-3 motion, as it would not support connectivity to LAX for many riders: travelers, airport workers, and South Bay folks transferring to Westside buses. Hahn’s motion was approved by the Operations Committee on a vote of 3-2. Boardmembers Hilda Solis, John Fasana, and Robert Garcia voted in favor. Dupont-Walker and Bonin opposed. This split vote sets up a potential showdown at the December 6 full board meeting. Hahn lined up boardmembers Solis, Fasana, Garcia, James Butts, and Ara Najarian as her motion’s co-authors, so she would only need one additional vote for the motion to pass. That C-1 connection is hardly a ‘crazy change’, it seems much more logical. If for no other reason, do it for longer trains. Do they really think riders will be flummoxed? Seems likely they will go with C-3 now, so when there is a big event at the Inglewood Stadium and the Crenshaw 2-car trains are packed beyond belief, people will fume at Metro and of course these Board Members will be no where in sight. Also, I am surprised Butts agreed to this since the Inglewood portion of the Line is worse off in C-3 over C-1. I don’t get it. If most south bay riders are going no further than LAX, wouldn’t they want to actually go to the future LAX stop as C-1 does. C-3 leaves them further away. I imagine the current LAX shuttles from aviation will go away once the LAX station opens. Metro board members are uninformed idiots doing a job they weren’t even elected to do (if they were elected at all). There’s no reason or intelligent decision making informing the transport policy of the US’ second largest metropolis. 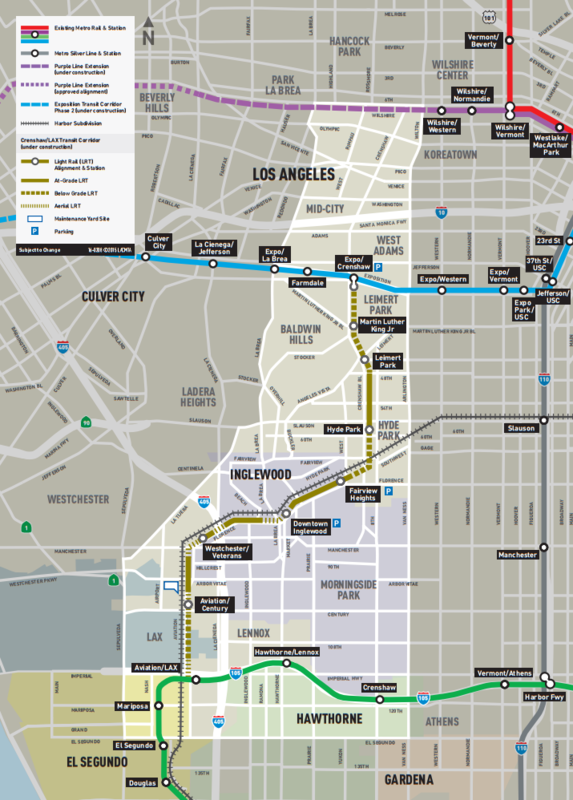 FTA Chooses Crenshaw Line for Federal Fast Track, Will It Lead to Faster Start Date? The Crenshaw North project is mostly funded in Metro's Measure M plan, but scheduled to open in 2047.